A toddler's ribs and skull were fractured and refractured leading up to her death, a court has heard. Professor David Mangham, a histopathologist, said he found evidence of "at least three" attacks on Eve Leatherland. Truro Crown Court heard the toddler was also poisoned with codeine. Her mother Abigail Leatherland, 26, and partner Thomas Curd, 31, deny murdering the 22-month-old at their then home in Liskeard, Cornwall in October 2017. The court heard Eve suffered 12 rib fractures, two skull fractures and a ruptured liver. Prof Mangham said three of the rib fractures had begun healing before being refractured. He said the older fractures occurred between three to six days before Eve's death and the more recent ones were one to four days old. He said the fractures had been caused by compression with a "significant" degree of force that went beyond "rough handling" or the force required to carry out CPR. Prof Mangham said Eve suffered a skull fracture from blunt impact to the back of her head three to six days before her death and a refracture there two to 12 hours before death. 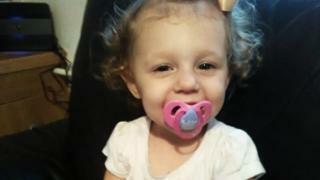 Consultant paediatrician Dr Deborah Stalker said she counted 19 surface bruises on Eve's head and body and 12 abrasions. She said there was "no explanation" for some of the facial bruises and they were "highly suggestive of abusive or inflicted injuries". The court heard Leatherland, who had moved to Cornwall from Mansfield, Nottinghamshire, earlier that year, called 999 to say Eve was not breathing on 5 October 2017 but she could not be revived. Leatherland and her co-defendant Curd, from Watford, deny murder and the alternative charge of manslaughter by gross negligence. They also deny causing or allowing the death of a child.